While drones have been mostly associated with military applications during the last decade, they are now slowly making their way into the mainstream. We’ve written before about how new developments in drone technology and machine learning can be deployed to help improve crop yields, besides delivering groceries and medical supplies. But all this may be just the tip of the iceberg in this new era of the drone. These remote-controlled, unmanned vehicles may also help stem the tide of illegal wildlife poaching that decimating not only animals on the land but in the waters of the oceans as well, where they may very well play a huge part in the future of ocean surveillance. 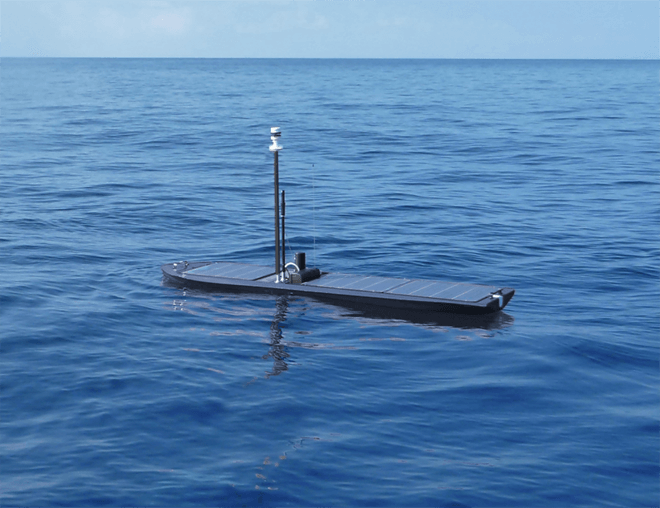 One example is the wave- and solar-powered Wave Glider, an autonomous surface vehicle (USV) for the ocean that recently completed a four-month long surveillance mission covering 2,808 nautical miles (3,231 miles) through the South Pacific. The aim of the voyage was to help the UK Foreign & Commonwealth Office (FCO) protect the Pitcairn Island Marine Sanctuary, touted as the world’s largest, continuous marine reserve, established last year. Besides accomplishing an impressive 213-day journey without the need to refuel, the mission gathered 9,516 instances of meteorological, oceanographic, and marine biodiversity data in remote, inaccessible areas rarely traveled by humans. The data is being used by the U.S. Department of State-sponsored Fishackathon, a program that brings developers together to create new technologies to stop illegal fishing. The project is about more than just plopping a stealthy drone in far-off waters. The Wave Glider is being developed by Sunnyvale, California company Liquid Robotics, which hopes to leverage the same technologies that are changing our lives on land — sensors, big data, Internet of Things connectivity and cloud computing — in creating an “ocean network” covering the vast, unknown frontier of our oceans. 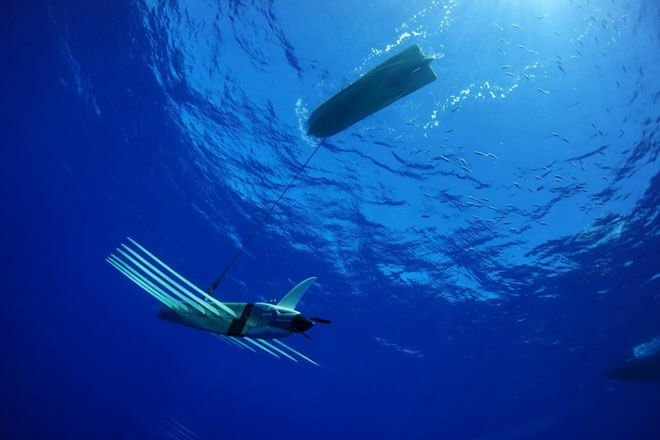 Inspired by founders Roger Hine and Joseph Rizzi’s initial attempts to create a machine that could record whale songs, the Wave Glider is essentially a data- and energy-harvesting robot, or as the company describes it, a “persistent mobile data-gathering platform” that’s able to collect data around the clock. Since it’s powered by renewable energies harnessed from ocean waves and sunlight, it’s capable of propelling itself without human intervention for up to a year. The machine is actually made up of two parts: one part that is submerged and connected to another part that floats on the surface of the water. Put together, the parts are continuously converting the kinetic energy harvested from the up and down movements of ocean waves into forward propulsion, though it is admittedly slow-going at 3.5 miles per hour. When the seas get too calm to generate enough energy, the drone’s solar-powered backup system takes over, using solar energy that’s stored in a battery. In addition, the solar system can provide more thrust when it’s needed in unexpected scenarios (think hurricanes, high currents and other wraths of the sea), and is also responsible for powering the sensors. The Wave Glider’s autonomous navigation system would allow for communications in real-time, as well as the ability to deploy a coordinated fleet of gliders. The drone acts as a kind of mediator between underwater acoustic communications and radio transmissions above the water, pairing a surface radio antenna and modem with an underwater counterpart. 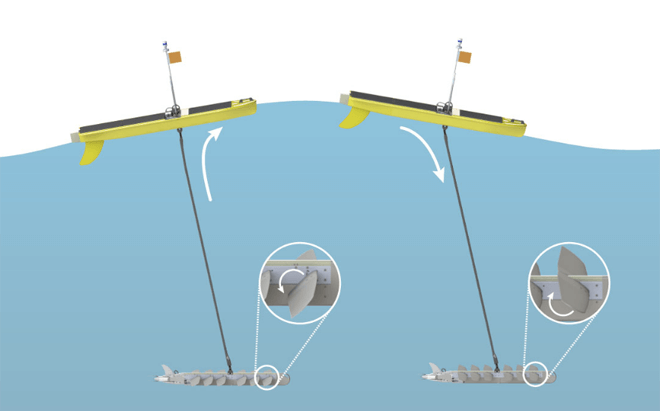 The Wave Glider’s system allows data to sent and received much more quickly compared to other solutions that may send data too slowly or not permit enough movement. 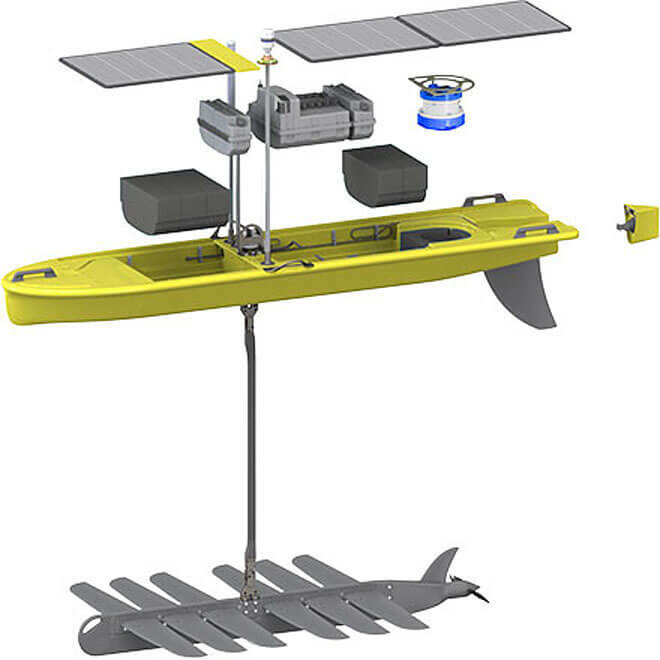 In addition to this increased marine connectivity, the Wave Glider uses an open sensor and payload integration architecture, characterized by a flexible design that permits a “plug-and-play” approach to swapping out different sensor modules for different applications, ranging from weather forecasting, collecting ecological and geophysical data, providing a point for satellite communications, as well as tools for engaging in monitoring and defense. It’s still too early to know what kind of large-scale impact these types of autonomous vehicles will have, but in contrast to the slow, fragmented and often unreliable systems of ocean exploration and surveillance that are already in place, ocean drones like the Wave Glider could revolutionize scientific understanding of our oceans, besides giving governments viable tools to stop overfishing in its tracks. The thought of these technologies potentially establishing an interoperable and seamlessly networked marine Internet of Things is pretty tantalizing too; after all, the data these robots are collecting will no doubt play a part in forming future policies and international agreements over marine territories. It’s a brave new world for our oceans, and drones are helping to lead the way, hopefully for the better. Read more at Liquid Robotics.